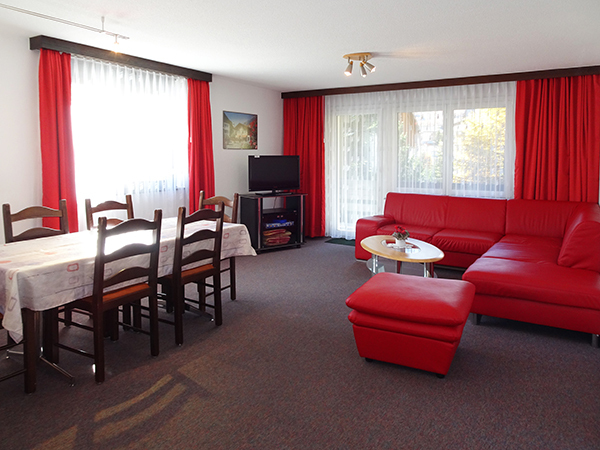 4-Zimmer-Wohnung / Nichtraucher, 95 m2, 1. Stock, für ruhige Personen und Familien. Haustiere nicht gestattet. 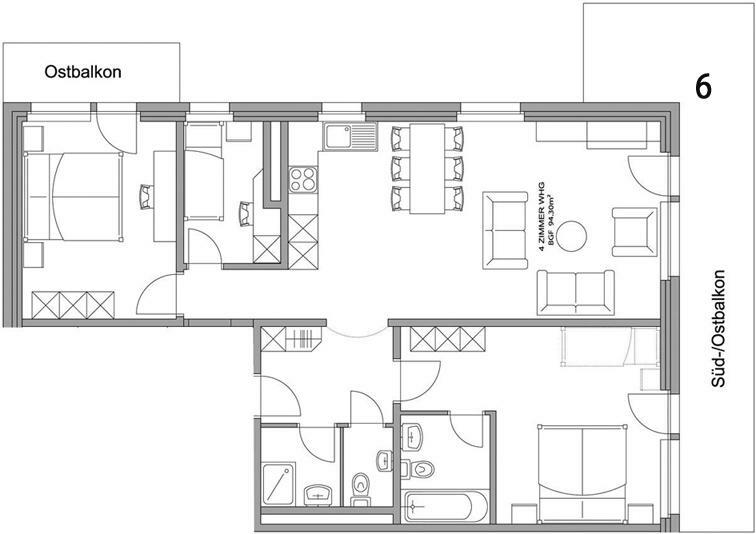 Moderne, komfortable Wohnung für 5-6 Personen bestehend aus einem Doppelzimmer mit Ostbalkon, einem Einzelzimmer, einem Doppelzimmer mit Südbalkon, Bad und WC, Dusche, separatem WC, Haartrockner, Wohnraum mit Sitzecke, TV-Flachbildschirm, Radio, Südbalkon, Kochecke mit Geschirrspüler, Mikrowelle, Backofen, Toaster und Kaffeefiltermaschine. Gratis Wireless LAN. Die Betten sind bezogen. Appartement pour 5 personnes avec une chambre double avec balcon au sud, bain et toilettes, sèche-cheveux, une chambre double avec balcon est, une chambre individuelle, douche et lavabo, toilettes séparé, grande salle de séjour avec TV écran plat, radio, balcon au sud, cuisinière, four, toasteur, lave-vaisselle, micro-onde, machine à café filtre. Accès internet Wi-Fi gratuit. Les lits sont déjà faits. ​*Age minimum pour louer 25 ans. 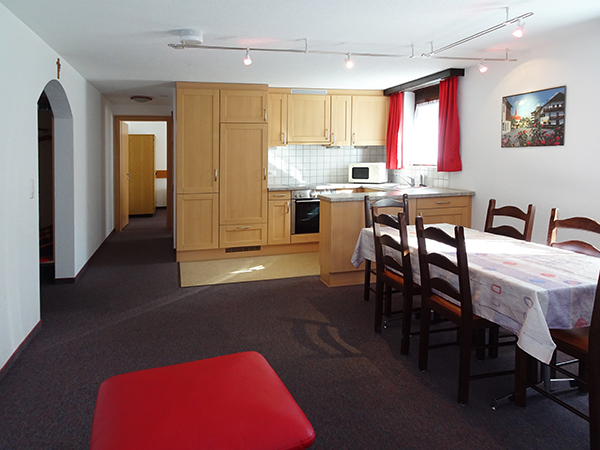 * Nous ne louons pas nos appartements aux groupes de ski et snowbord. 4-room apartment/ non-smoking, 95 m2, 1st floor, for quiet people and families. Pets are not allowed. Moderne, comfortable, large apartment, suitable for 5-6 persons comprised of one double room (twin bedded) east facing balcony, one single room, one double room (twin bedded) with south facing balcony, bath and toilet, shower, separate toilet, hairdryer, living room with flat screen TV, radio and south facing balcony, kitchen with dish-washer, microwave, oven, toaster and coffee filter machine. Free Wi-Fi internet access. The beds are done. ​*Minimum rental age: 25 years*. 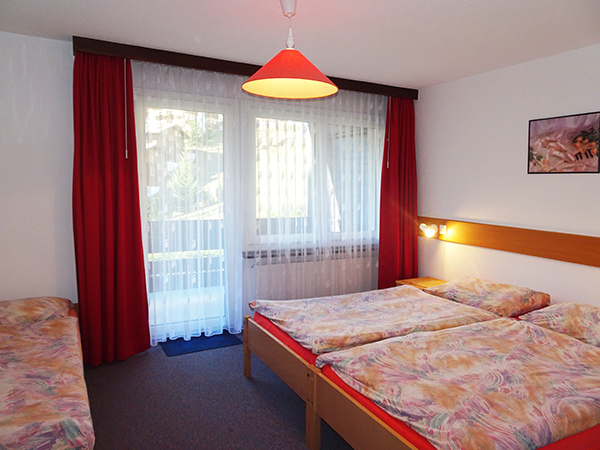 We do not rent our apartments for groups, ski-clubs or snowboard groups.